Discussion in 'Axe, Tomahawk, & Hatchet Forum' started by jake pogg, Apr 12, 2019. I've looked for that but no cigar. Do you have a link? I like how he describes the upsetting as not moving the metal into the corner but rather away from it. Being an "armchair blacksmith", I appreciate laymen explanations lol. Trailsawyer, muleman77 and rjdankert like this. It's another way of pointing out the consequence of using overly long log dogs. I'd be interested in knowing where this tendency originates and what the rational underlying it could be. For instance, what prompts you to determine the length you choose? Ernest,i'm sorry,my experience is so limited...I did dance the Dance of Death,on top of the log-walls,with my chainsaw...(in the bad old days,on jobs with no equipment to get the log back down after scribing;then i got smart and only worked on the ground,on notched vertical stumps,no further dogging was necessary). Square_peg, Agent_H, Trailsawyer and 1 other person like this. Bob,thanks again.Here's an article on the one i meant,with a good photo. (that giant mass at the corner is the result of a really neat skew-weld...). Agent_H, muleman77 and Square_peg like this. Me going on and on and on strictly about securing a log for squaring-up - hewing to the many. Excuses. That's not exactly accurate. He's moving steel away from the inside of the corner and into the outside of the corner. There are times when, for whatever reason the log is hard to secure, but it's my point and one key is sinking the end of the log dog into the workpiece near its center of gravity and not up high which I see as the convention springing from log dogs in these excessive lengths. It's only logical and predictable that the further the log dog is anchored above the centerline the less constrained this leaves the under side and it's free to go with the forces exerted. Still, I'm confident one can get a secure hold with the right dogging and without going overboard either just with sufficient attention to the all-round mechanics of the prevailing conditions. I've seen some pretty slack anchoring jobs at the windmill down the road, the old miller last I checked running out of patience and nobody willing to take the operation off his hands. Of course the whole damn building is pretty shaky at that time. Agent_H, muleman77, Downwindtracker2 and 1 other person like this. For broad axe hewing the length of the dog is related to the dia. of the stick to be hewn. My preference for a decent size and weight stick is to dog the stick directly to a yoak-a round log support, 3'-4' long with a flat bottom for sitting on the ground and a V notch for the stick to be hewn to rest in. The dia. of the yoak is related to the dia. of the hewn stick. When the yoak and the stick are dogged tight, the center of the stick should be about 24" high for sustained, all day, day in and day out hewing, for me. This changes with every man's size, arm length, etc. 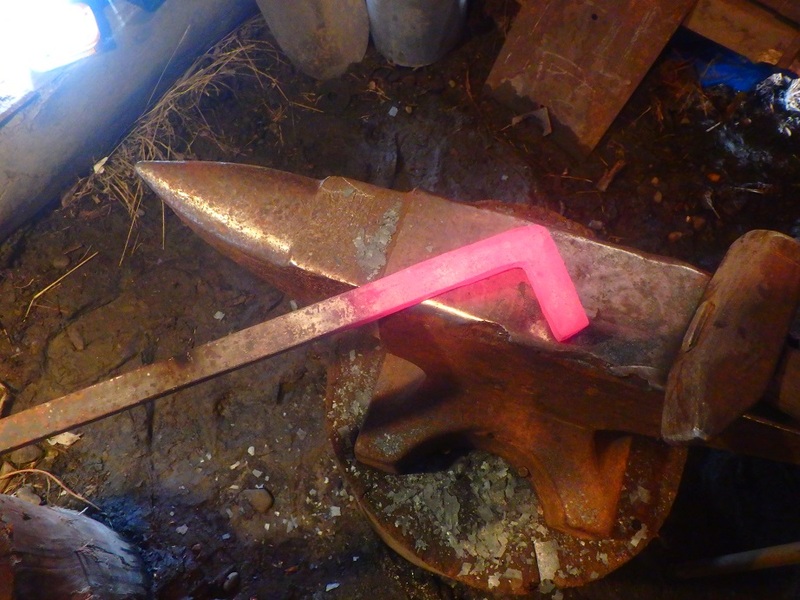 This set up is quick and easy and, if done properly, will prevent the stick walking on you when using the broad axe. I am not a fan of the European trestle support system. It permits the stick to walk on the flat top of the trestle, and adding a V block to the top of the trestle just makes it worse, unless the V block is bolted rigid to the top of the trestle. Also, trestles are a fixed height, so you dont have any adjustment for different dia. sticks. 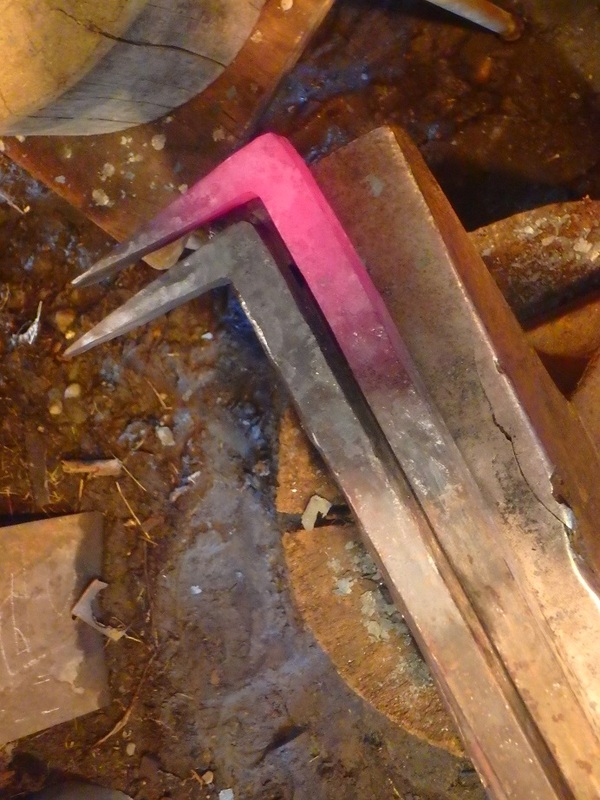 The yoak system can be adjusted, to a point, by cutting the V notch deeper, cribbing under the bottom of the yoak, or hell, just make new yoaks, it's quick and easy. As I have said before, for a visual of this watch "These Old Cabins Logs" video. Agent_H, Trailsawyer, Fmont and 6 others like this. Ok,my friend decided that articulation wasn't necessary,and now i just need to come up with a couple of simple,20" long dogs(stock is 3/4" sq.). Here's a quick summary of a beginning of the process. junkenstien, Fmont, Yankee Josh and 4 others like this. Looks like my kind of broad axe hewing log dog Jake! junkenstien, Agent_H, Yankee Josh and 5 others like this. Jake's photos in "Display Mode"
Those look terrific Mr. Pogg! The "Devil" at work, black smoke plumes rising over the ridge, twisting steel into unnatural shapes, the whole affair sounding quite "upsetting". junkenstien, Trailsawyer, Fmont and 6 others like this. Thanks,Old Axeman,and everyone,for the input. junkenstien, Old Axeman, Fmont and 6 others like this. Agent_H, A17, Old Axeman and 1 other person like this. It actually helps quite a bit to talk to like-minded folk,who understand. I'e left a minimal,maybe insufficient length past the bend. (My specs call for 4"-5",and the actual is a bit over 4"). The more i look at it,the more i begin to doubt the sturdiness of the spike,it being A36,(or 1018-1020 at best). I may steel both points of each,once i finish them.it really woulda helped to think of it before drawing points that fine...). Agent_H, A17 and Yankee Josh like this. It's hard from the pictures to judge the length of the blades. My own measure 3 inch, (of course that's on a much shorter over-all length), so these coming in at 4 must be good, even about right. 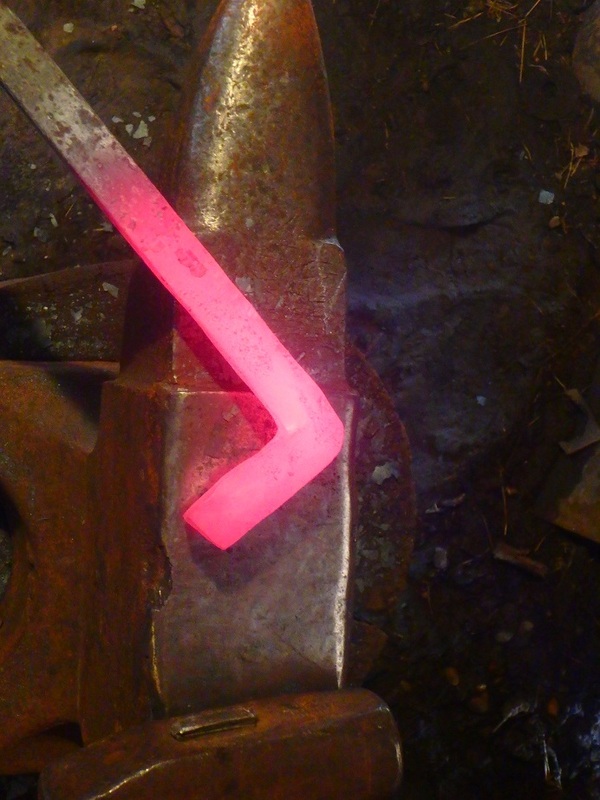 It's a delicate balance but better somewhat short than too long, so long as when they get set there is sufficient space between the front of the corner and the side of the work piece for hammering them loose at the out-side. With these lengths though the corner is likely up high enough that it leaves plenty clearance though you'll be going in at a steep angle but more on that latter (sorry, I can't resist a bit of a jab here and there). It's just that hammering up from the bottom is self defeating, driving the blade down and in as it does instead of up and out. Did you use 5/8? That helps. But, there is always a big but, I move on to other log dog aspects indicated in these pictures and in this case it is the geometry of the blades, in particular the side going into the work piece. You have what is common in this asymmetrical edge configuration, that is the inside flat and the outside beveled, like a chisel. Me too, I got that set-up and have decided to alter it to a symmetric bevel to hopefully address a specific problem. More often than not, and this is exacerbated by, once again, the long dog length, the angle the blade enters the work piece is steeper than we would like it. In work on the initial side it's irrelevant, the wood at the anchor spot is expendable, on the second and subsequent surfacing it can be that is not so and the cut where the dog holds will be permanent. Now, I've got no problem leaving evidence of method behind, a hole in a beam where the log dog was is no defect as I see it. But when there is a blow-out because the blade has gone in at a sharp angle and not had sufficient support, it's not nice and doesn't exhibit a lot of competence. It seems to me that the chisel edge is more prone to exerting force outwards where a double beveled edge will more equally distribute those forces that want to blow out the outside in a steep entry. 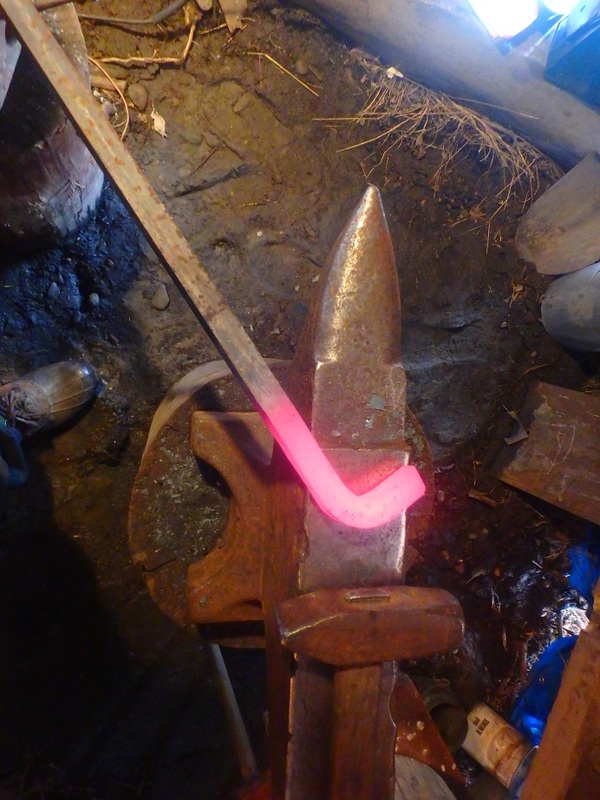 And then there is the matter of what the angles and configuration should be, too wide they won't grip, too narrow the blade will deform and the holding force is diminished. Is the bevel long and extended or an abrupt short one, (I avoid the awful term often associated with a secondary bevel). Probably all this minutia is tedious for some but I love it. Funny, on my entry no goofy little yellow androgynous figures showing up even when I put them there. junkenstien, Agent_H, A17 and 2 others like this. You mean single-,vs double-bevel in terms of angle of entry,i take it? I know you work with lots of hardwoods;do you find that driving/dislodging these mangles the steel much?Do you ever wish for them to be harder/stiffer steel,to avoid mushrooming or bending? Do you end up having to file the points periodically,is that why you mention secondary bevel? 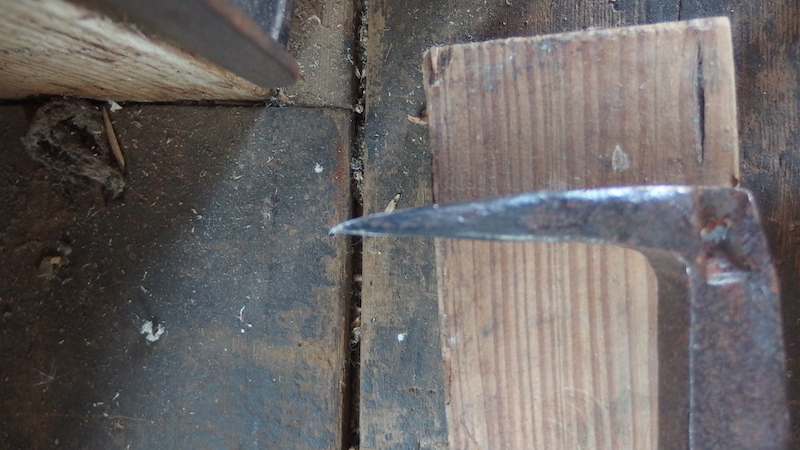 On blowing wood out...It used to be that when nails were forged(and later cut,but before wire-nails),they all had chisel-point. In use it was oriented Across the grain,so as to sever it,and avoid splitting(immediate,or built-in pressure that'd likely cause a split later). In driving the nail that severed grain's ends bend inward,jamming against the rough forged-surface of the nail,which created that holding power wholly different from the lousy modern round-sectioned wire-nail. So dogs have a chisel-point,and it's oriented With the grain.Is that to reduce the holding power,making it easier to dislodge them later? Agent_H, A17, Trailsawyer and 1 other person like this. Course it's all for the good cause and obviously not a criticism of your good work Jake, going at it in the spirit of open-mindedness and rationality, the way you do do. 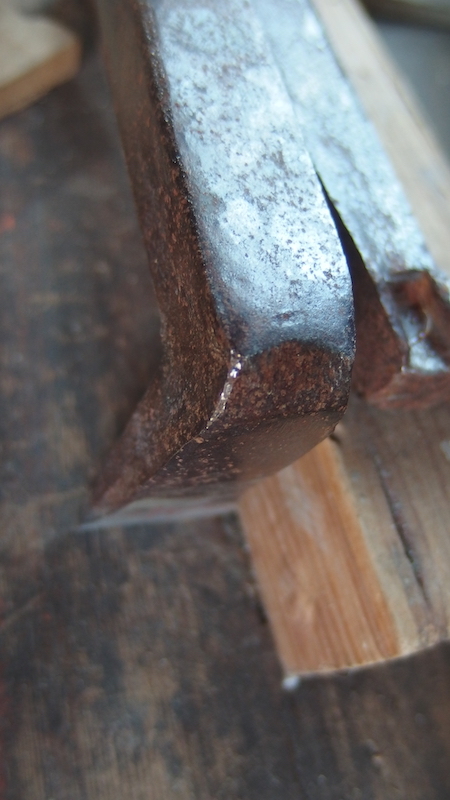 Single bevel: The focus is unfortunate but the inside is flat, the top or outside, beveled. I think this is what I see in your forgings Jake. 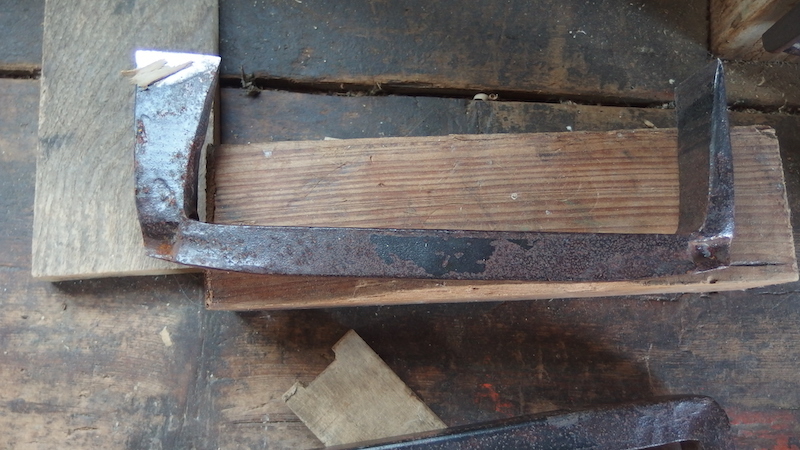 Double bevel, which of course is standard on the staging side blade of the log dog: Another log dog and one with the improved edge, as I see it. Sure I find that these wear more than I'd wish for. Do you have any solutions? 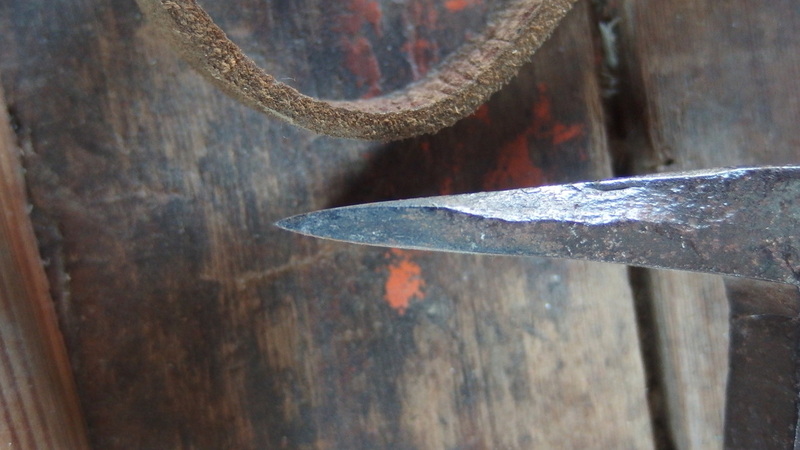 The cheat, with pinched corners, all sagging down, compressed like that: I don't mention secondary bevel with regard to maintaining the edge, only concerned with a better grip one less prone to blow-out. I know what your going on about with the mechanics of cut nails and I buy it and always have. At the same time I do see the forces at work in the two instances not really being comparable. 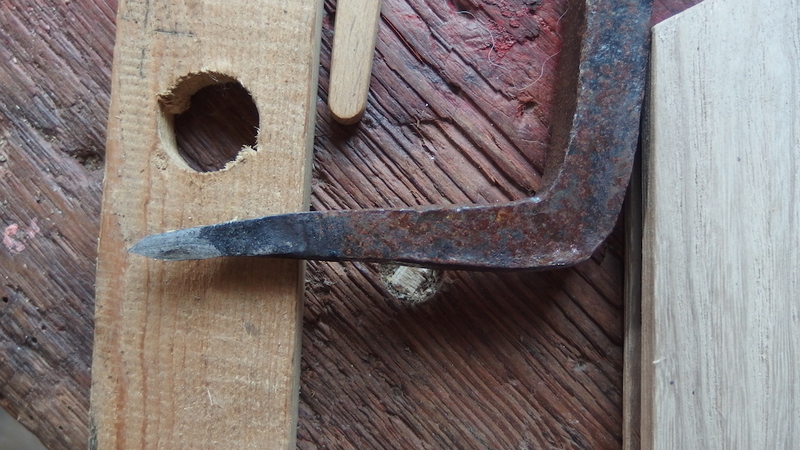 I think if you were to anchor across the grain it gives the least secure grip, weakening the grain head on like that. Unlike the Old Axeman I have more ambivalence towards a spike-like grip or a point, pin all that.... I find they give a good hold, in fact are maybe too difficult in releasing, I guess because they are easier to set more deeply, they are indifferent to grain direction, and leave a less intrusive mark. I think they hold over-all less solidly, maybe its only an impression, and as shown the blade is weak. We don't have to go into the meager construction of this one. There is much room for improvement it's obvious. I Really appreciate all this,Ernest,thank you. (It must be getting very close to your trip,and i thank you for going through all the trouble unpacking the gear...). It's great to see a bunch of variants of a real working tool,never enough of this. Wear marks,re-sharpenings,assorted mushrooms and distortions,that's the real data for attempts to forge a better tool. Well...The solution would of course be welding on of steel(higher C)to all the wear-prone areas,points and the strike-areas at shoulder...(Next level would be the HT'ing of those...). I posess an old German caliper,and (it being neglected like all my tools and self-etching ambiently) i noticed with surprise that it has these minute steel pads forge-welded to the inside of the jaws,and the points...(it also says "fully hardened" right on it). I'm concerned with points more than the shoulders(in particular on yours i see no scary degree of mushrooming on latter). I may try padding them with steel,here in a bit. (which may even run to a pointed config.,so i'll try my best to provide for that). Agent_H, A17 and Trailsawyer like this. The design of the ends that enter the wood--edges at 90 deg. to each other-- is for holding power over the pointed varieties. 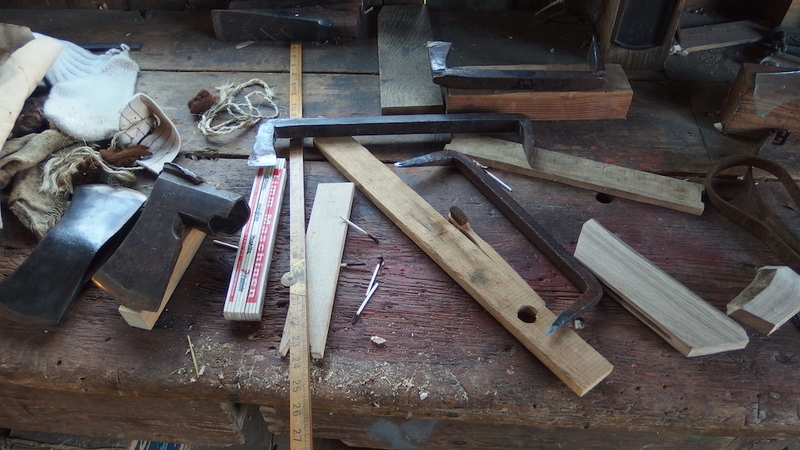 As to blow out and damage to your hewn first side from the dog (when you move them, one at a time so not to loose the plumb setting on the stick in the yoaks) when hewing the second side--I dont find it necessary to always put the dog in the stick at the center of gravity. If you use the V notched yoak system, and the stick to be hewn and the yoaks are of substantial size and weight, it wont walk on you. I put the dog in the unhewn top, above the already hewn first side. Mushrooming and distorting when driving the dogs can be prevented by driving them with a wood maul, like a froe club. I like osage orange, dogwood, etc. Nice work Jake. Trailsawyer, Agent_H, jake pogg and 2 others like this. I dont find it necessary to always put the dog in the stick at the center of gravity. During the discussion the one rational I could come to for a longer log dog was this effort to avoid "marring" a finished surface by giving primacy to anchoring in the waste even at the cost of securing the vertical orientation. As long as one keeps an eye during the whole process on the center line at the end grain, (I check it periodically against a fil à plomb) vertical orientation can be maintained through corrections, and if need be improvisations. This all presumes you are willing to go to these lengths merely to mask the process. Agent_H and jake pogg like this.